Championing new forms of cinema, celebrating the masters of the past, and engaging with audiences have always been fundamental values of the Walker’s Moving Image department. This tradition continues with the launch of the Mediatheque, a new onsite screening environment that invites visitors to screen their own selection of titles from the Ruben/Bentson Moving Image Collection. This project is the culmination of several years in the making—with Caylin serving as the project manager of the Mediatheque and archivist for the Ruben/Bentson Collection, and Anthony as the technologist for New Media Initiatives. 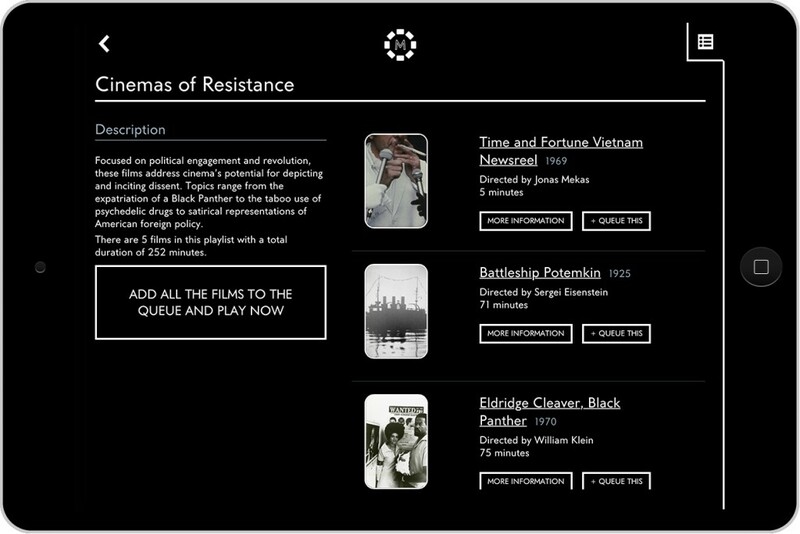 The Mediatheque merges both the on-demand, modern culture of selecting movies with the classic, immersive cinema experience. The Mediatheque is situated within a long history of programming unique, culturally, and historically significant films at the Walker. As early as the 1950s, films were programmed on the Walker’s campus as well as off site at important cultural organizations. With the establishment of the Film Department in 1973, the Walker began acquiring film prints by some of the most influential filmmakers of all time, such as D.W. Griffith, George Melies, Charlie Chaplin, and Maya Deren. The collection is currently comprised of more than 1,000 titles with strengths in the American and European avant-garde, early American cinema, Soviet cinema, and the films of William Klein. Created to further the understanding and appreciation of film as an artistic medium, the collection provides audiences, especially residents of the Twin Cities, with an opportunity to watch films that they might not otherwise see. 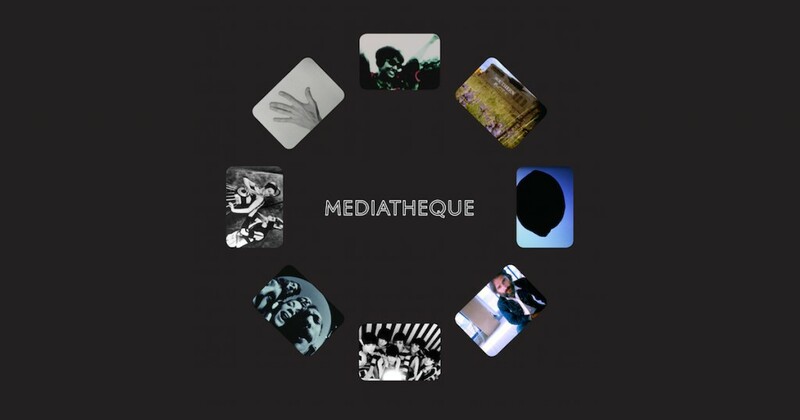 In order for initiatives that provide collection access, like the Mediatheque, to become a reality, the collection’s preservation needs first needed to be assessed. Beginning in 2012, the department undertook extensive work to stabilize its collection of 8mm, 16mm, and 35mm celluloid prints, update collection records, and review for copyright concerns. As the department obtained permission from filmmakers, prints were cleaned and digitized according to best practices using 2K technology. 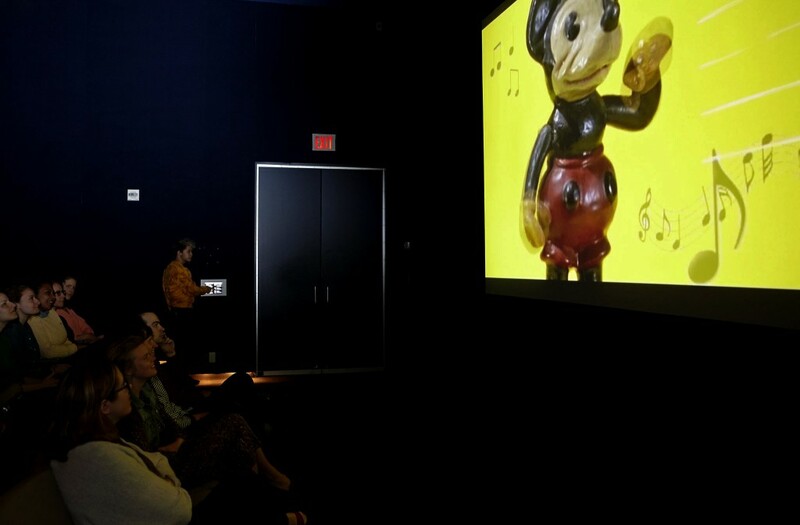 Besides preserving the films in the collection, digitization efforts also created more possibilities for exhibiting films throughout the Walker campus. However, what differentiates the Mediatheque from other spaces on the Walker campus is that it allows you to curate what you want to watch, as well as preserves the cinematic experience we’ve all come to know and love—viewing films on the big screen. The Mediatheque features a diverse range of collection titles and aims to appeal to anyone with an appreciation of cinema, from aficionados to newcomers. 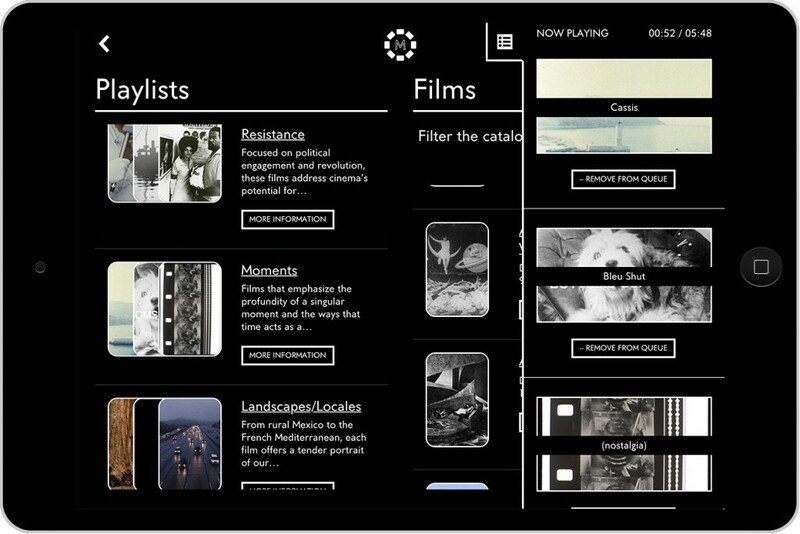 Using a touchscreen remote, you can browse thematic playlists or browse individual films. You can narrow your findings using the filter functionality. Filters include director, decade, nationality, and genre. 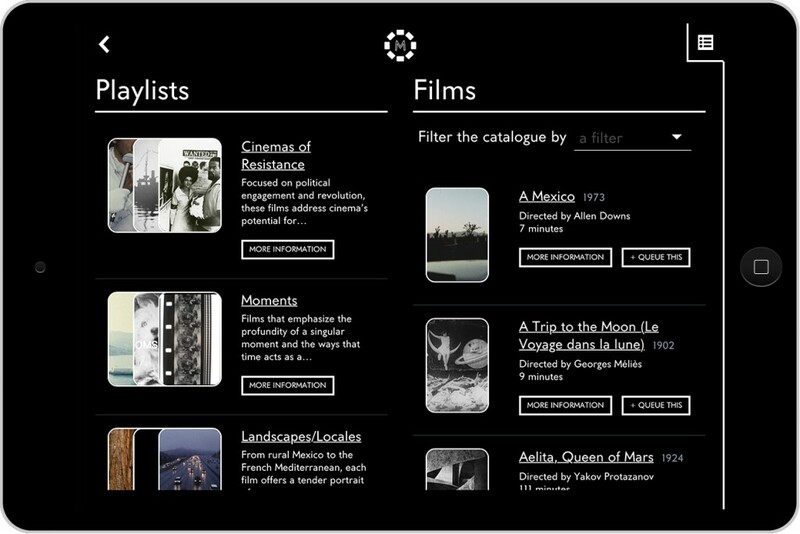 Playlists provide a broad thematic window into the collection. You can choose to either add all of the films to the queue or just select titles. Once a title is selected, you can then read a brief description of the film as well as view stills or a short clip before choosing to queue the film. Once a film is queued, it is projected onto the Lecture Room’s cinema screen. The queue controls the order in which films are played. More than one visitor can select films to watch, and the films are screened in the order in which they were added. If you add a film to the queue and decide to leave partially through, another visitor is welcome to remove that film from the queue and play their selection. 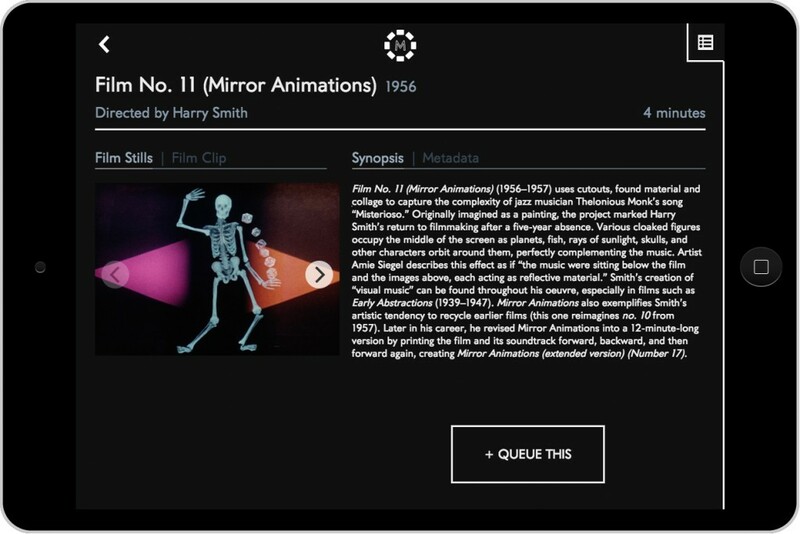 In the coming days, we will be publishing a more in-depth post that covers the digitization and development of the Mediatheque, the Walker’s first native application. It has been an amazing experience to architect, design, and execute a unique screening environment that provides our broad audience with unprecedented access to this incredible collection. We encourage you to join the audience even if others are already playing a film. Who knows? You might experience something new.